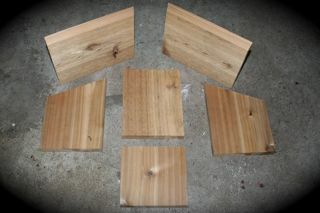 The wood should be at least 3/4 of an inch thick to insulate the birds from the cold. The bottom of the house should have holes or a loose bottom board for drainage. The house should have a few holes near the top of the birdhouse to let heat out but should be protected enough to not let rain in. 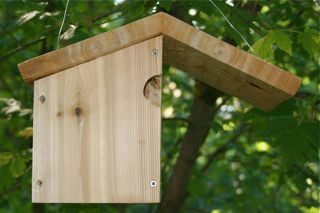 The size of the birdhouse hole and hanging height depends on the type of bird you are trying to attract. 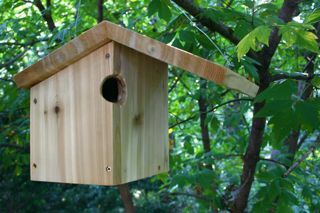 I call my birdhouse design "aviary halfway home," since it is intended to look like half of a birdhouse from the front. I used cedar wood because of it's natural ability to resist rot in the elements but any wood you have available will work . I drilled a 1-1/2" hole in the corner to create the half of a hole effect. I'd be lucky to see a blue bird in my neighborhood but it's worth a shot. I also went a little overboard and used stainless steel deck screws. Nails work too, but the screws go into the wood easily and will be more secure. I also wood glued all sides of the birdhouse to seal the wood joints. except for the bottom which I will take off to remove old bird nests. You are welcome to build your own "Aviary Halfway Home" and improve upon it, but if you do you have to send in a photo so I can post it. Plus if this article inspired you to design your own birdhouse, I'd love to see the finished project. It may also be a good idea to contact your local Audubon Society to find out which birds need the most help recovering in your area. Now go and build it for our feathered friends.